I’m a big fan of Rachael Ray for her simple, everyday recipes for my family, but I’m also a fan for what she’s done to help me feed my three cats, Harley, Bocca and Cupcake. Most people know Rachael for her skills when it comes to making people food, but she knows a thing or two about healthy pet food, too. In 2007, Rachael began working with a team of pet nutrition experts to launch her line of Rachael Ray™ Nutrish® pet foods. The foods are made with simple, wholesome ingredients like real chicken and fish (which is always the number one ingredient). Rachael Ray™ Nutrish® cat foods are dedicated to “Real Recipe. Real Ingredients. Real Good,” and never contain any “junk,” like meat by-products, artificial flavors or preservatives. In other words, the same qualities you look for in meals for your family are the same qualities you can rely on when feeding your cats! 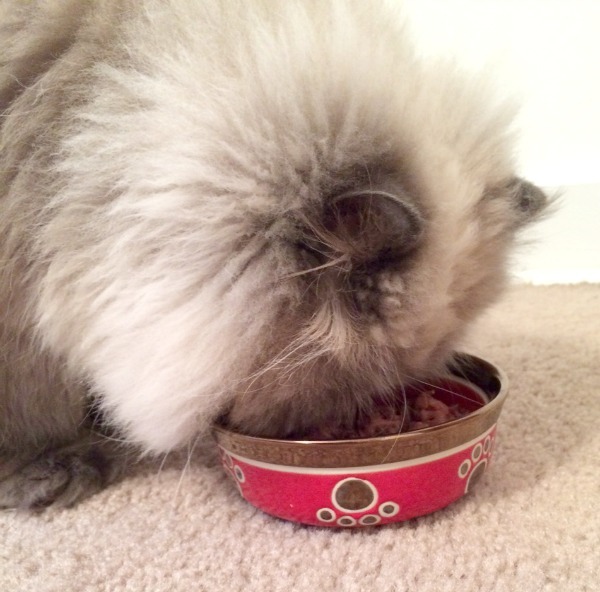 But before I show you how much my fur balls love Rachael’s food, I wanted to show you how I help them work up an appetite with a cat toy you can make at home in about 15 minutes! 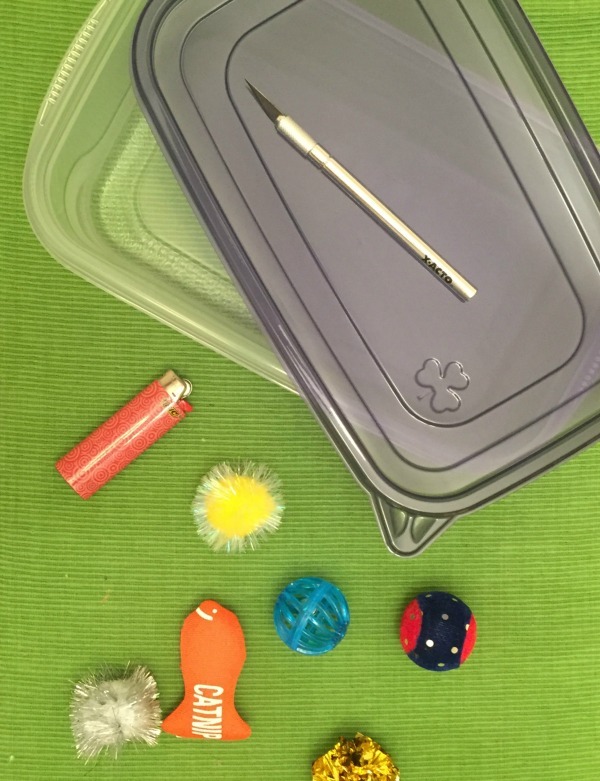 To make yours, all you need is a large disposable food storage container, a sharp cutting tool (an xacto knife will do), a lighter, and some cat toys and treats. 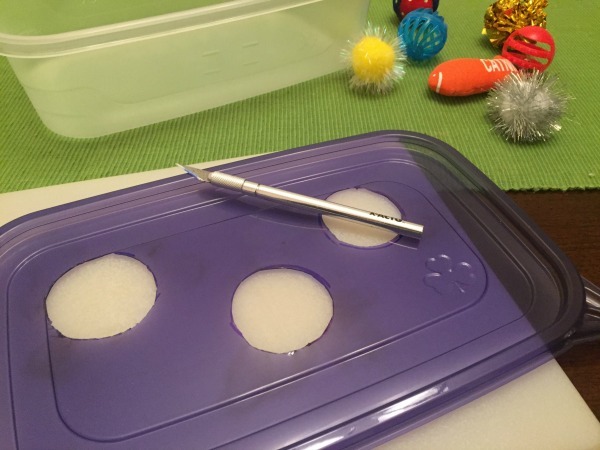 First, cut three holes in the top of your container lid. I traced my holes using shot glasses and a black marker and then cut the holes out with the xacto knife. Next, use your lighter to burn the edges of your cut holes to smooth them out. 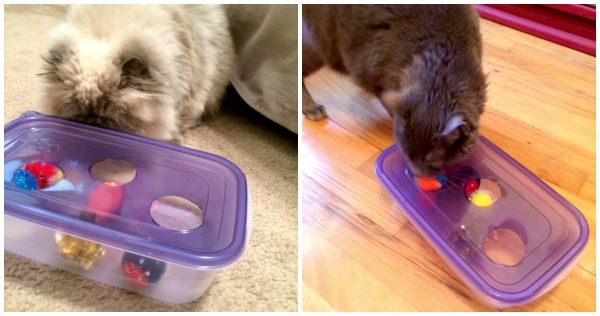 Then put your cat toys in the container, put on the lid, and let your kitties have fun with it! You can buy a bag of various cat toys for less than $5 at the grocery store, but also feel free to put any household odds and ends in there. Here are two of my trio checking it out (Cupcake and Bocca – Harley was being camera-shy). Getting pics of them actually playing with it wasn’t easy. Case in point below. All blur! After about 15 minutes of pawing at their new toy, it was dinner time. I dished up some Rachael Ray™ Nutrish® Grain Free Wet Food for Cats. Each flavor is made with real chicken or seafood. Never any grains, meat by-products, fillers or artificial flavors and preservatives. Just good stuff like vitamins, minerals and taurine for your kitty! 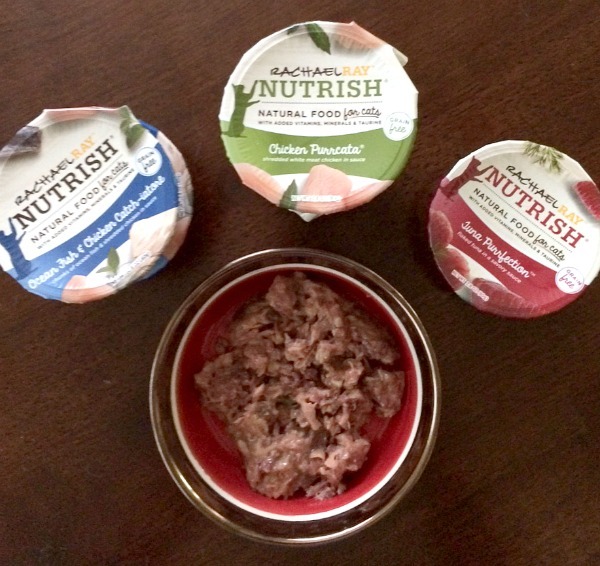 Rachael Ray™ Nutrish® wet and dry cat food varieties are available at a wide variety of stores (I got mine at Target) as well as on Amazon. Check out this tool to find a retailer near you. 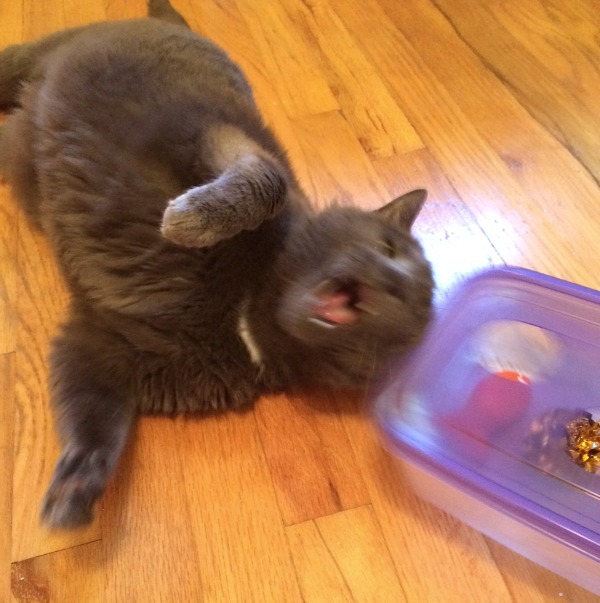 For more fun tutorials and cat-related goodies, be sure to follow Rachael Ray™ Nutrish® for Cats on Pinterest. Rachael’s personal proceeds go to Rachael’s Rescue, which was created to help shelter pets in need. To date, she has donated over $14 million. This money has gone toward food, medical supplies and treatments for these unfortunate animals. This is such a cute and easy idea!! And you have the cutest cat models! We used to have a blue point rag doll and an orange tabby. They would have loved either one of those toys! This is such a cute toy! I would have never thought to make this! Haha! What a great idea! I really love the one with the grey cat. He looks like he’s laughing. That toy is really cute and easy! One of our pack likes to hide the toys, so this would put an end to that! What a great idea for a cat toy. My cats would love it! 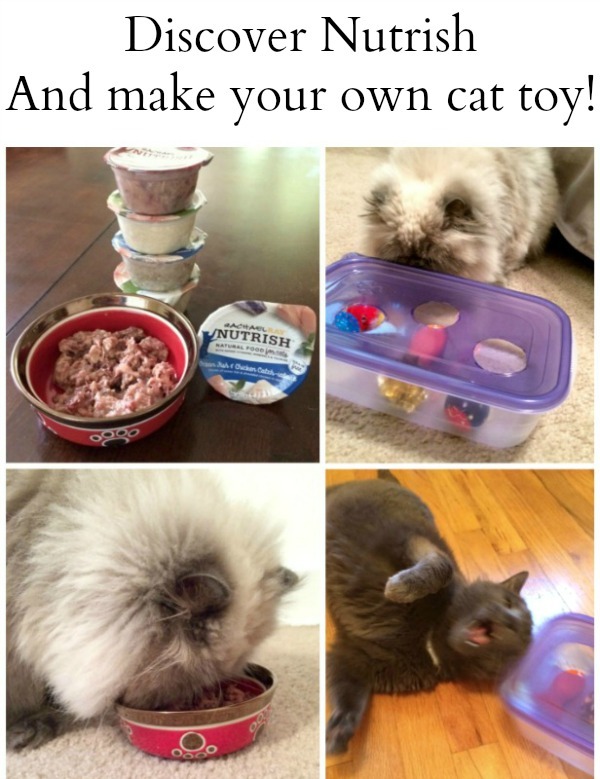 What a fun and easy idea to entertain the cat. I bet they are fascinated for hours with this toy which of course works up quite the appetite. We’ve always been dog owners but your cats are adorable! I’m going to share this post with my friends who have cats. I am a dog blogger and know a lot of cat moms and dads. This is a great post I’d be happy to share with them. I will see a lot of them at the BlogPaws Conference this month in Phoenix. Cute cats! that is such a cute idea for an activity to do with your cats. Your gray cat looks just like my Misty! I can’t wait to try your idea! My kitty is going to go bonkers for this! She loves to play sooooo much!